Hungry? Finding a place to eat has never been easier with our restaurant guide. The best OBX moments can happen over the course of a meal. 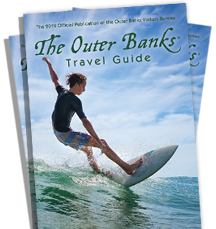 That&apos;s why when it comes to places to eat, the Outer Banks offers the best variety of dining in North Carolina and beyond. We&apos;re known for our independent and locally-owned restaurants, so be prepared to try something new and delicious. From seafood specialties to steak, pizza to beach barbeque, every tasty meal has its place here. For discriminating palettes and pocketbooks, Outer Banks restaurants serve a variety of fare; Southwestern, Steakhouses, Buffets, Grills & Pubs, and Cross-Cultural cuisine to name a few more. And yes, you&apos;ll find fresh NC seafood harvested earlier that morning by an Outer Banks fisherman, working the waters as his or her grandfather and father did generations before. If you want to truly immerse yourself in the culture, try local ingredients including farm-raised oysters in Hatteras, unrefined honey from Wanchese bees, or even a sprinkling of sea salt straight from the Atlantic Ocean. Filter restaurants from Duck to Hatteras Village based on Name, Distance or type of Cuisine you enjoy. Here is a list of Outer Banks restaurants that are open during the winter.